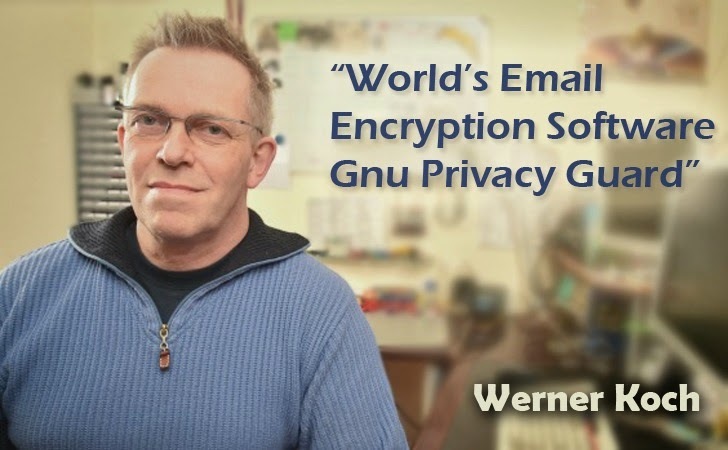 Werner Koch, the man who authored the free email encryption software, is running out of funding to continue the development of his crucial open-source GNU Privacy Guard (GnuPG) encryption tools.The code works on plenty of operating systems from Linux and FreeBSD to Windows and OS X. The popular Gnu Privacy Guard (GnuPG or GPG) email encryption software is the same used by the former United States National Security Agency (NSA) contractor and whistleblower Edward Snowden to keep his communication secure from law enforcement authorities. GPG uses the OpenPGP standard to safeguard the communications of millions of people, including journalists, dissidents and security-minded people, around the world from eavesdroppers and other miscreants. Werner Koch has been maintaining and improving the code of his own secure email software since its initial development in 1997, and since then he has worked at very low wages, but is now looking for a big funding in order to keep his project alive. GPG provides protection to a number of multibillion-dollar technology industries, and the code works on a lot of operating systems from Linux and FreeBSD to Windows and Mac OS X. Although Koch has had help a number of companies and organisations over the years, he pretty much works alone on the project. After the news broke when Propublica published an article about Werner Koch, the financially-struggling developer of the popular privacy software, a handful of companies came forward to help and fund Koch’s project. "If there is one nightmare that we fear, then it's the fact that Werner Koch is no longer available," said Enigmail developer Nicolai Josuttis. "It's a shame that he is alone and that he has such a bad financial situation." Yesterday a tweet from Koch’s twitter account revealed that he had been granted $60,000 by the Linux Foundation, while the official donations portal of Linux had racked up €123,253 at the time of writing, which is over its €120,000 goal. "For a critical project of this size, two experienced developers are required for proper operation. This requires gross revenues of 120,000 euro per year," the company said on its website. "Unfortunately, there is currently only one underpaid full-time developer, who is barely able to keep up with the work." Also on the same day, the popular social network giant Facebook and credit card processor Stripe announced that they will each donate $50,000 per year to fund the development of encryption software GNU Privacy Guard. "Thank you all," he tweeted early on Friday morning. Last year, the operators of the open source cryptographic software library, which secures hundreds of thousands of Web servers and many products sold by multi-billion-dollar companies, also ran out of budget. After the existence of Heartbleed, a security flaw in OpenSSL exposed user passwords and the private encryption keys needed to protect websites, the OpenSSL project received funding from a number of organisations and companies, including Linux foundation, HP, IBM, Red Hat, Intel, Oracle, Google, Cisco, and many others. Now this is time to help the popular GPG. You can donate to the GnuPG project here.